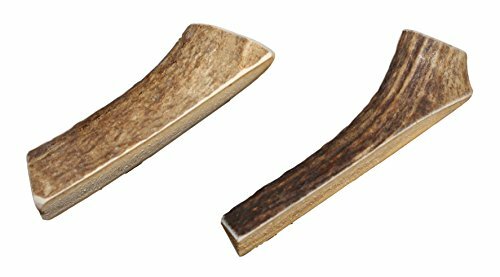 Elkhorn Premium Chews Small, Split, Twin Pack - Grade A Premium Elk Antler Chews for 10-20 lb dogs – Naturally shed from wild elk – No Mess, No Odor – Made in the USA by Elkhorn Premium Chews at Pet-O-Institute. Hurry! Limited time offer. Offer valid only while supplies last. ELKHORN PREMIUM CHEWS - ''The Best Nature Has To Offer'' Single Ingredient: 100% all-natural elk antler hand-collected from wild elk in the USA. Nature's Best: We select only Premium, Grade A antlers to create our chews. Grade A antlers are the highest quality antlers available on the market. Our antlers are picked off the forest floor soon after hitting the ground and before they become bleached or cracked by the damaging effects of sun and wind. Grade A antlers are more dense, less likely to crack or splinter, and retain the maximum amount of flavor and nutrients for your pet. 100% Natural: All of our antlers are collected from wild, free-range elk in the USA - never from farms. Our antler chews are all-natural and contain no additives, preservatives, hormones, or fillers. We collect only natural sheds that have already dropped to the ground - no animals are ever harmed. Satisfaction Guaranteed: Your satisfaction is our #1 priority. If you are unhappy with your purchase for any reason, we will make it right...guaranteed! If you have any questions about this product by Elkhorn Premium Chews, contact us by completing and submitting the form below. If you are looking for a specif part number, please include it with your message. Herders Choice Chews Dried Cow Tails 6 pcs.